Around ten foreigners have disappeared in Libya after an attack by jihadist militias, the Czech Foreign Ministry has announced. Officials say the foreign oil industry workers may have been taken hostage. “There was a Czech citizen present at the spot, who has been missing since,” said an official statement. “Together with him, an Austrian citizen is unaccounted for as well as several other people from third countries.The present government is not in control of the situation. We recommend that all Czech citizens leave the country." “We are examining the possibility that a kidnapping has taken place,” Czech Foreign Minister Lubomir Zaoralek told Reuters. The minister said the Islamic State, which has recently become a force in the country, was likely behind the raid. The Austrian government has set up a crisis group with the help of the Libyan government for the return of its own nationalt. But the Vienna-headquartered energy giant OMV, which was servicing the site of the attack in the southern Al-Ghani oilfield, said that the specialist who disappeared had not been on its payroll. Among the other nationals allegedly caught in the assault that also killed 11 guards were citizens of Bangladesh and the Philippines, and another unnamed African country. Government forces claim they have now taken back control of the oil-producing facilities, which sustained “massive damage”. 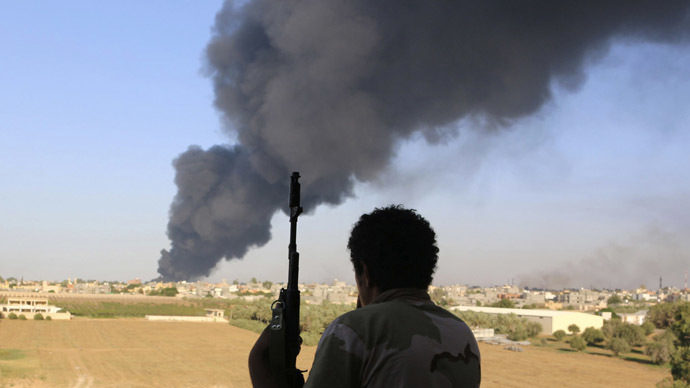 Libya's oil production has collapsed to less than half of its peak, since the toppling of Muammar Gaddafi in 2011. The moderate government has had to abandon the capital, Tripoli, and large swaths of the country, under pressure from radical Islamists and powerful opposition tribes.